BOKONBAEYVO, KYRGYZSTAN — Had to sleep a little bit this morning after the drama of being stuck on the mountain last night. Then it was time to meet up with one of the traditional Kyrgyz eagle hunters. Bokanbaeyvo is “home” to many of the practitioners of this ancient skill and I was lucky to be able to see first hand how the eagles are trained. We headed for the hills with the eagle in the car as I learned how the tradition is passed on from father to son. 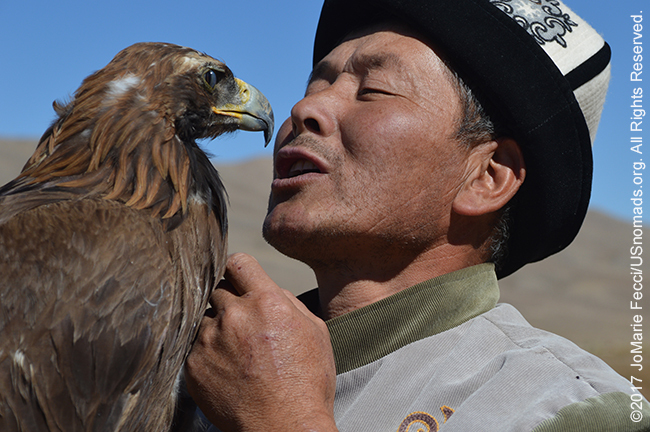 There are not so many eagle hunters here anymore, but the ancient tradition is being preserved and the men lovingly train their birds from a young age. A hunter gets his bird from the nest and raises it to excel at the hunt. Each bird has only one master, and the relationship between man and bird is remarkable. We are in the low hills, and I have to opportunity to see how the bird hunts when a rabbit is let loose on the desert floor. The eagle comes quickly and from the direction of the sun, so that it surprises its prey, swooping the animal up in its sharp talons and then holding it still on the ground until its master gives it the permission to kill. It is a remarkable sight to see the strong regal bird arc across the sky with such precision and grace. The hunter explains to me how he got this eagle from high in the mountains where a shepherd had noticed a nest. The hunter came several times to observe the baby eagle and when it was old enough to be taken from the mother, he had to climb up to the nest to capture his bird while the mother was away. He then took the young eagle home and became it’s surrogate parent, feeding it by hand, and little by little teaching it in the ways of the hunt. One of the techniques he uses is to take a fox skill on a sting and run it through the high grass for his eagle to chase until the eagle gets familiar with the fox. Most real hunting is done in the winter time, high in the mountains on horseback. The bond between hunter and eagle is strong and there seems something a little bit noble and a little bit magical about the relationship. The sport of eagle hunting today is celebrated in the region with festivals and competitions, even though the tradition is fading with the younger generations less interested in taking up the practice. In this family, the hunter’s father was not a hunter — it was passed from grandfather to grandson, skipping the “modern” generation.